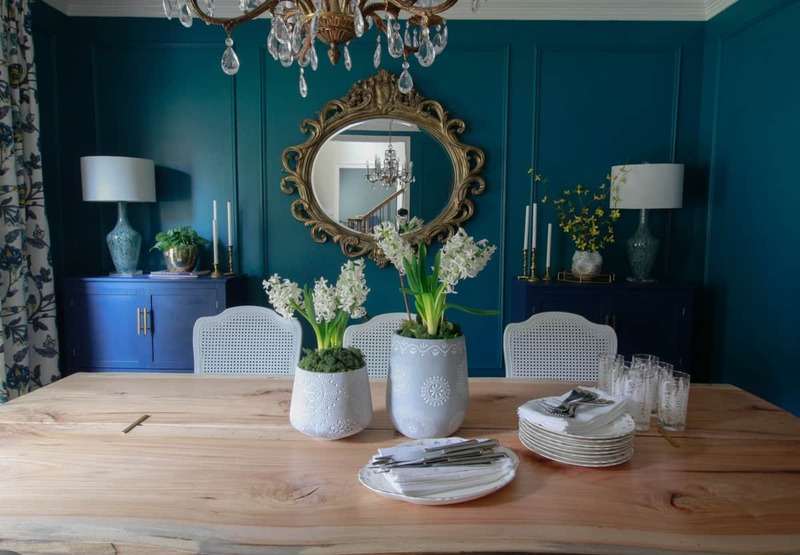 Today, I want to invite you into my home for a Spring Home Tour! 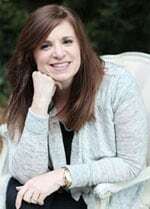 I’m joining a group of talented bloggers and our host, Krista from the Happy Housie. 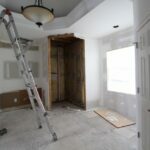 If you are coming over from Rambling Renovators or this is your first time here, welcome! I decided to take you on a home tour instead of just one room. 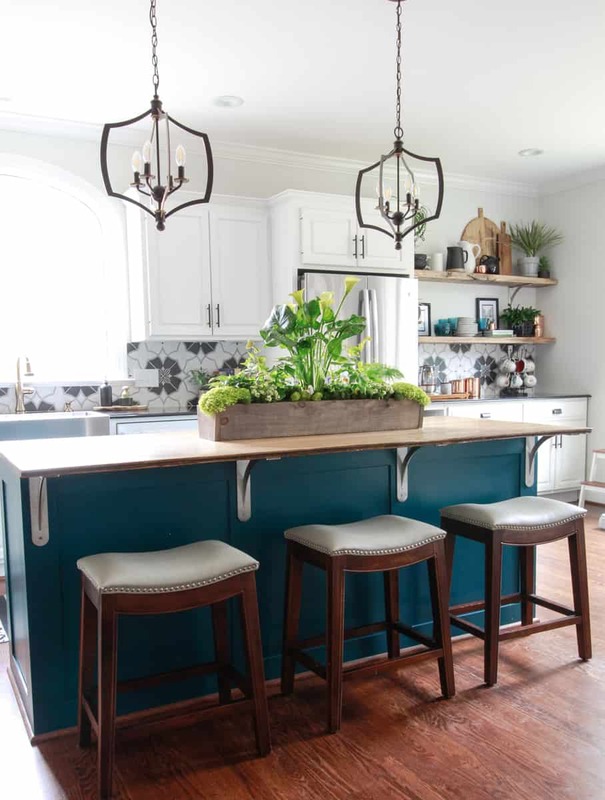 Since moving into our fixer upper, almost two years ago things are constantly changing, so unless you follow the blog via Instagram or email updates, you might have missed a project! Click on the appropriate link to do so now! 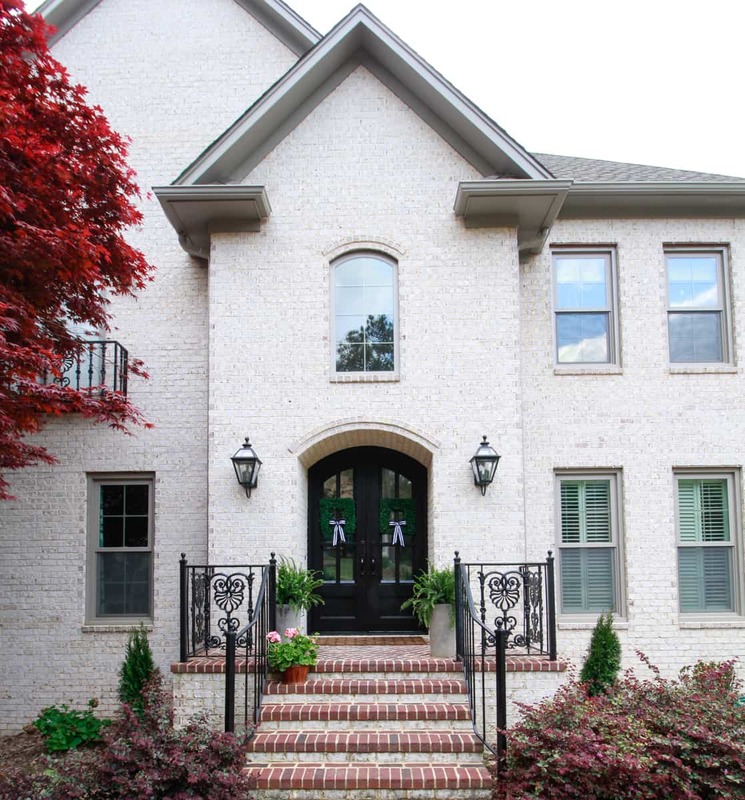 Let’s start our tour at the front steps and the arched entry, one of my favorite parts of the house since the remodel. 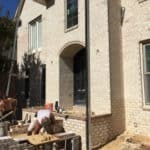 If you would like to go back in time with us and our fixer upper, click on the tab at the top that says Trail House Reno to see the dramatic transformation. Spring is here in Birmingham but despite the cloudy weather, the copious amounts of pollen clinging to every nook and cranny has me wishing for buckets of rain to wash it all away for good. Our faithful greeter, Tucker, was on the job and ready to say hello today. These Kimberly ferns will grow quickly here and I’m sure I’ll be scooting these vessels back to make room for passage to the front door. 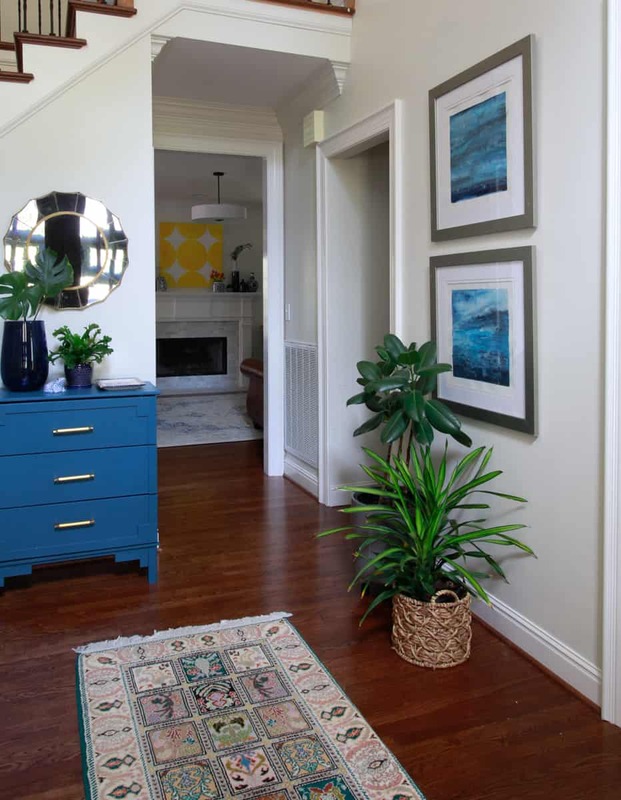 A quick look in the foyer where I recently added some new art and adjusted the color palette to make it more cohesive with the rest of the house. I repainted this Ikea hack dresser and added new watercolor paintings. The dresser is the perfect place to tuck leashes and drop keys from the entry or the basement stairs from behind. The dining room is the one deep and moody room in our house. And I must admit I love entertaining in here. 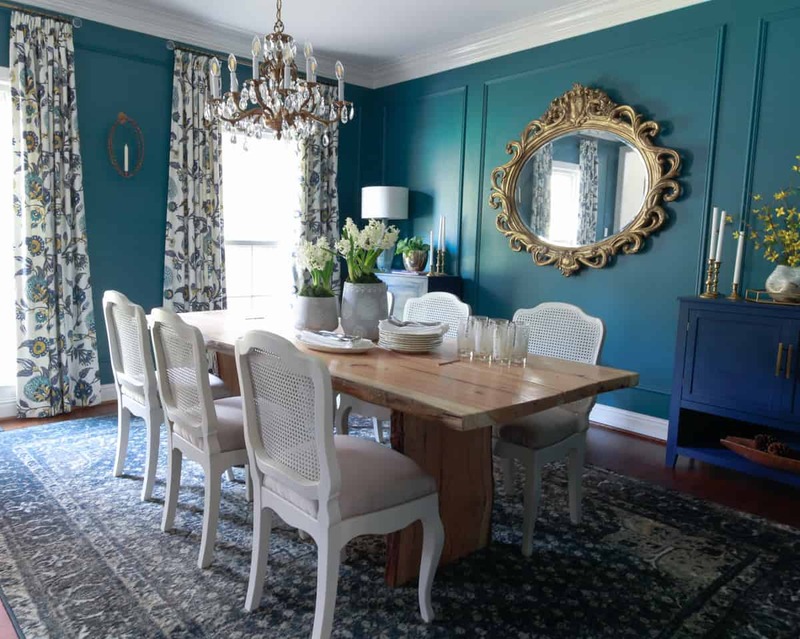 While it is a dark color in a relatively dark room, the rich teal feels vibrant and not at all somber. Each Easter, I look forward to pulling out the floral dishes passed down from my husband’s grandmother. Simple flowers ring each plate providing the perfect table setting for spring. This is the first time I’ve brought hyacinths in for the spring and they smell divine! I am certain this is going to become a new tradition. 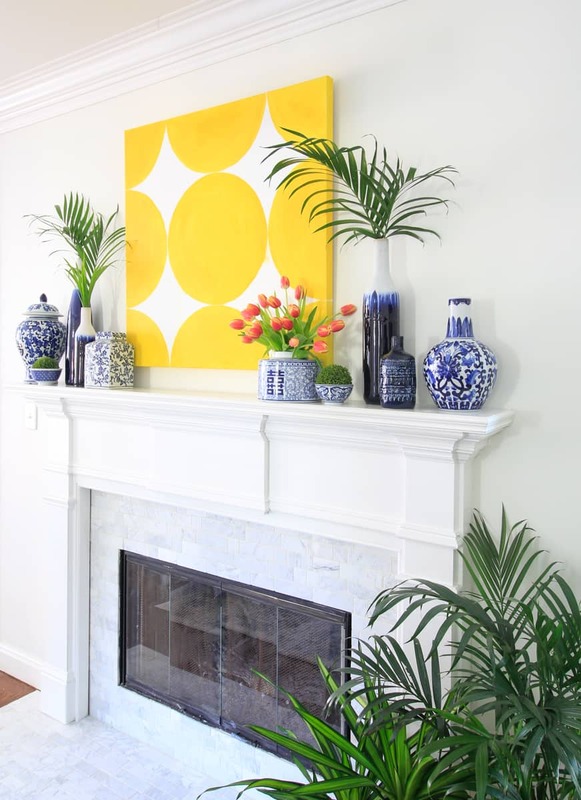 In the living room, the newly renovated fireplace feels fresh and vibrant! The old black stone was replaced with honed marble mosaic tile and the mantle was simplified in keeping with the architecture of our home. 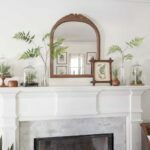 I’ll be sharing a complete how-to tutorial for renovating a fireplace soon. Be sure to stay tuned. 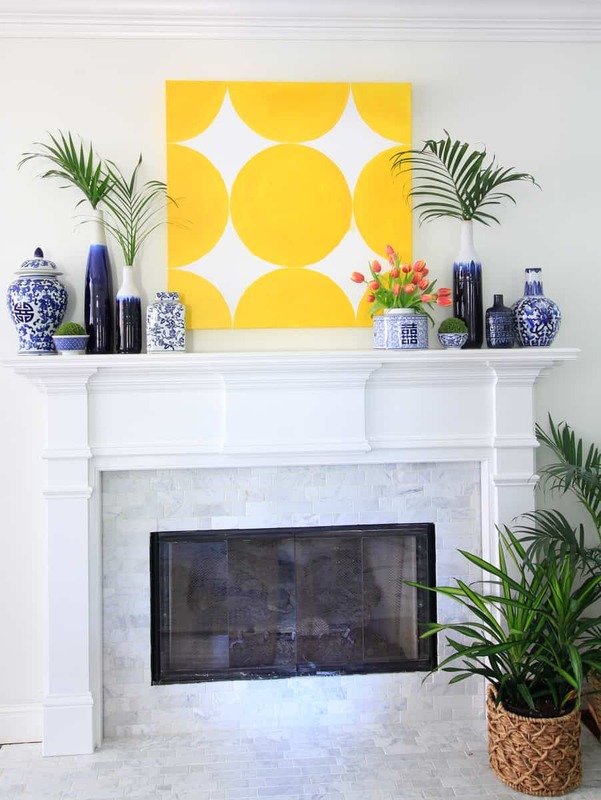 The yellow circular art makes a bold statement in the room now and you can learn to paint your own, click here. A few more updates in here are bringing the room a little bit closer to the vision I have for it. 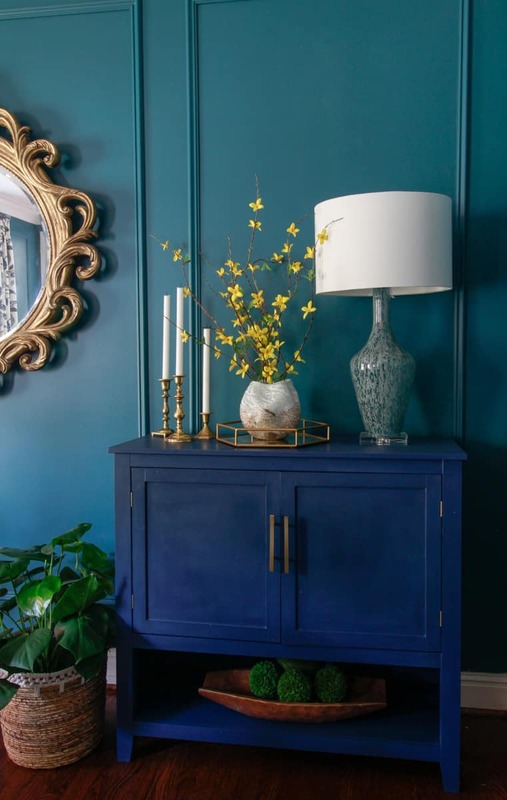 First off, I finally painted the thrifted brass coffee table an almost black color to bring it in line with the new etagere from Ikea. 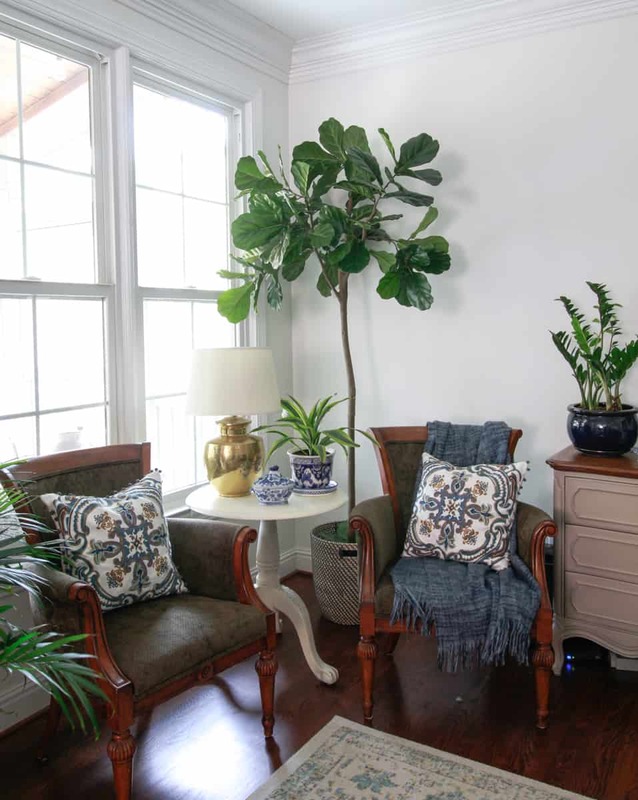 These new botanical prints, a collection of free printables from On Sutton Place, are an obvious addition for spring, but I’m so happy with the way this gallery came together that I think they might be here to stay. The frames for the prints were lucky clearance finds at Michael’s. I loved the subtle detail on the edges. I purchased them even though I knew the washed wood would not provide enough pop on my white walls. Nothing a little flat spray paint can’t fix! 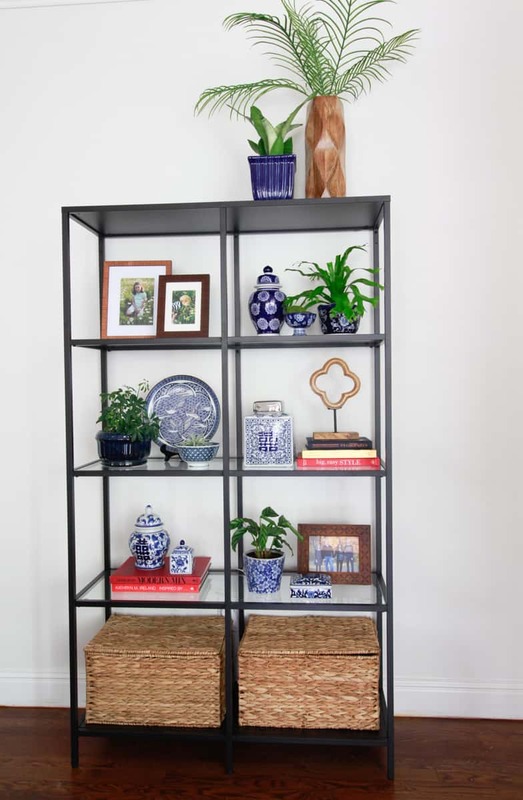 I as I mentioned, I also replaced the bookcase that was here with a simpler etagere and styled it with my favorite blue and white ceramics and plants. I look forward to refreshing these chairs and replacing the leather sofa this fall. All in due time I keep telling myself. 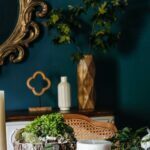 Because I do believe that a room that comes together slowly often has a chance to grow and evolve in ways that a “go out and buy everything new” scenario does not and of course, there’s that pesky budget scenario too. 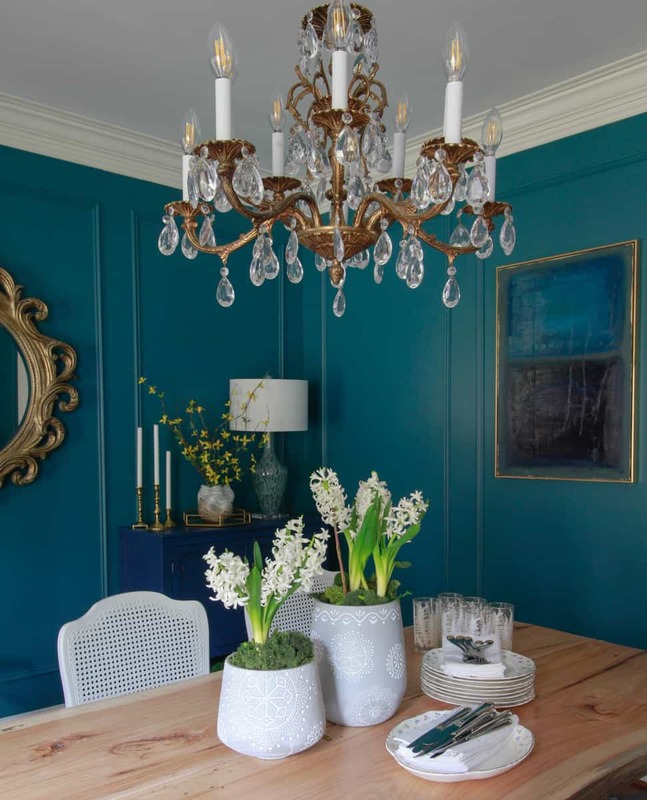 In the kitchen, like in the dining room, I focused on creating a spring look with a living arrangement to create a longer lasting focal point. The arched window in the kitchen is south facing, so the plant lady (that’s me!) was looking for an opportunity to take advantage of the copious amounts of sunlight for more plants! The island is the perfect spot. My inspiration was a springtime mossy woodland garden. 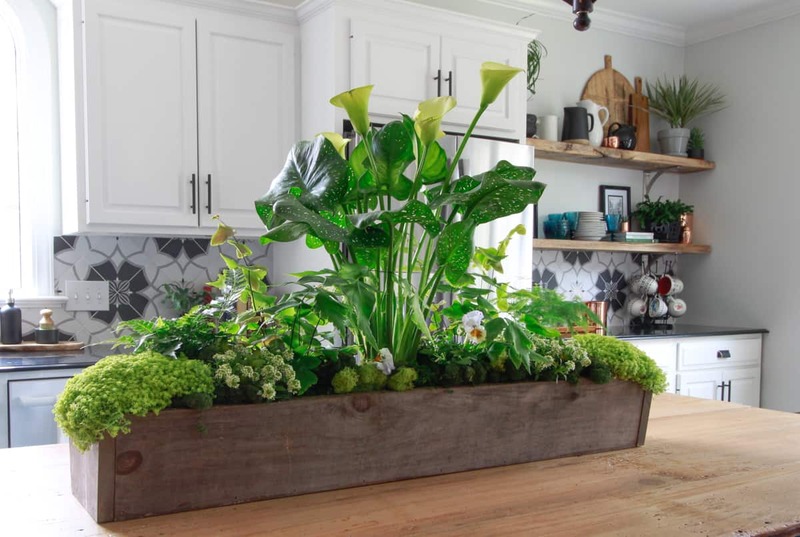 Varieties of ferns combined with lush, mounded sedum and a spotted calla lily created the soft green mossy color palette I hoped for. After a failed attempt at creating this mossy garden using a container I already had, I built a more suitable wooden container for all the plants I had collected. The narrow footprint still leaves me plenty of space for meal prep. 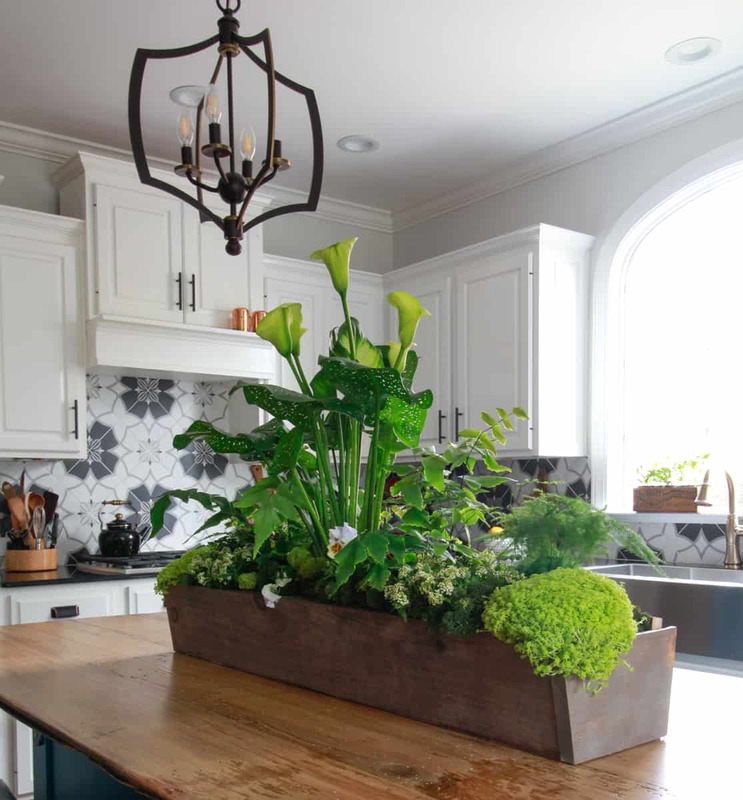 I love the simplicity and the angled edge that turned out to be not only an esthetically pleasing design, but also is the ideal shape for the slope of potted plants. 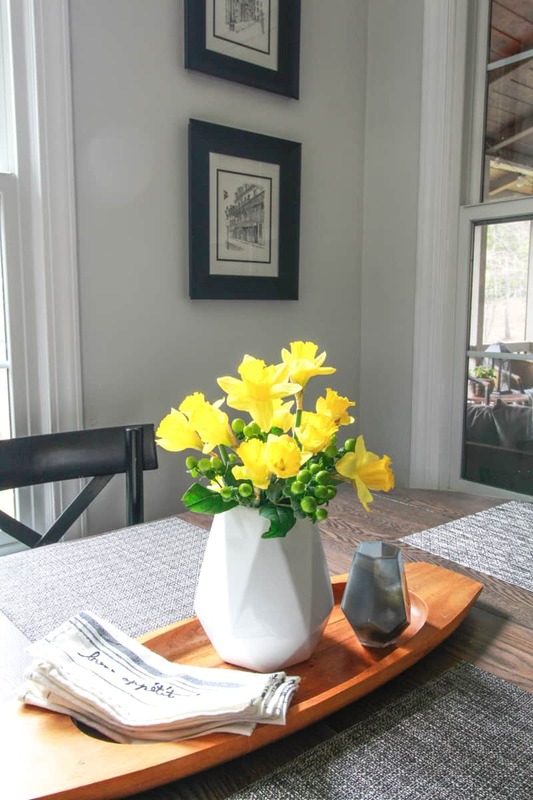 Of course, how can I have a spring home tour without at least one vase full of daffodils? The flat tray I picked up while thrifting in Atlanta a few weeks ago is a good way to corral a few napkins and a candle too. 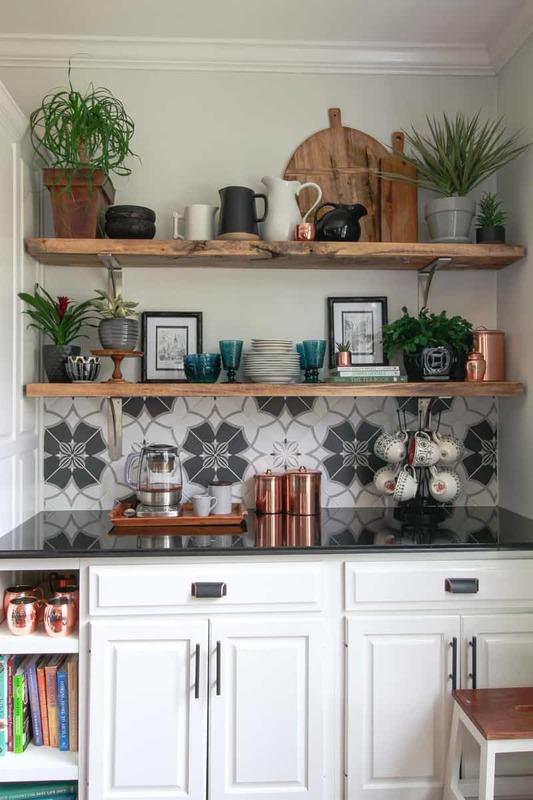 If you’ve been around here for any amount of time, then you know my favorite spot in the kitchen is the beverage center. I start each morning here with a cup or two of chai tea. I think this is also my favorite part because this didn’t even exist in the original kitchen. It was just an empty space with no purpose or style. 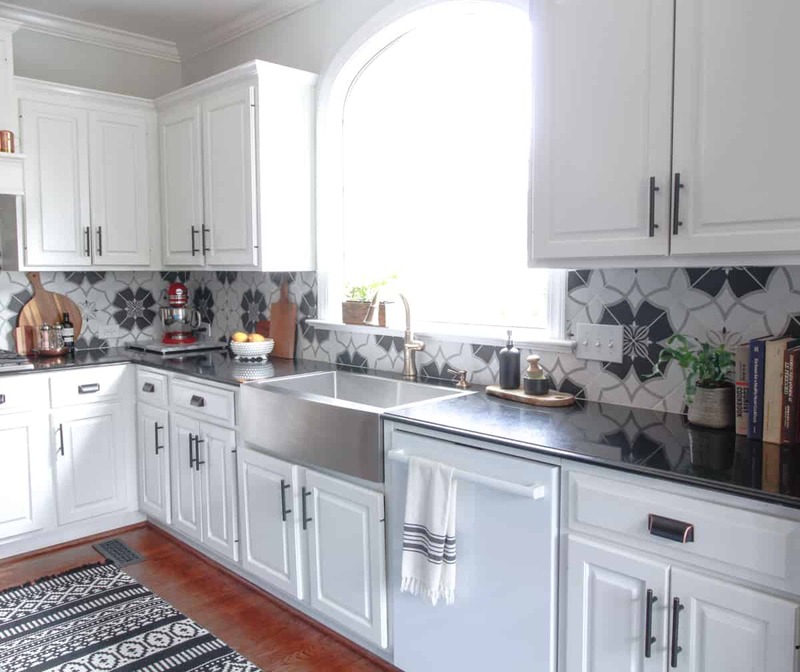 For details on how we remodeled our kitchen using the existing granite and cabinets to stay in our budget, see full kitchen reveal here. 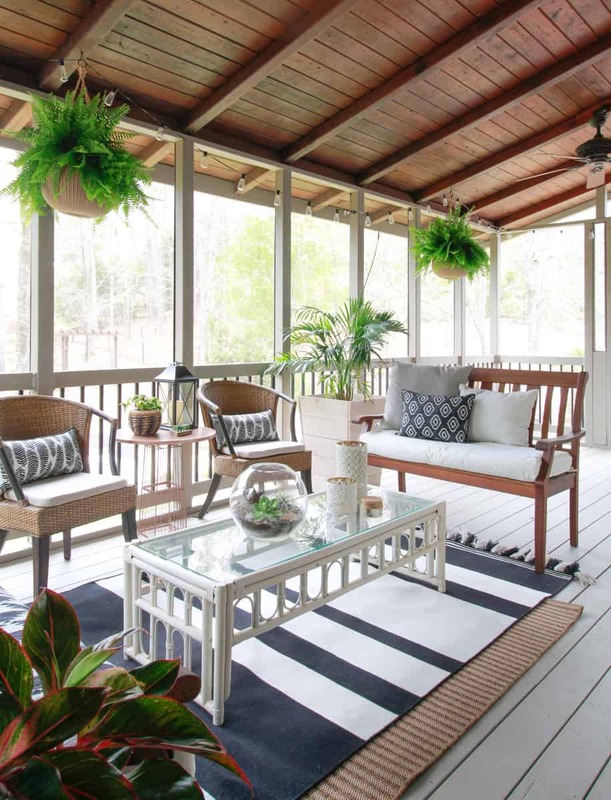 I can’t think of a better way to cap off a spring home tour than with a stop on the clean screened porch! Once that invasive pollen completely settles, this is where you will find me, Tucker and the rest of the family too! 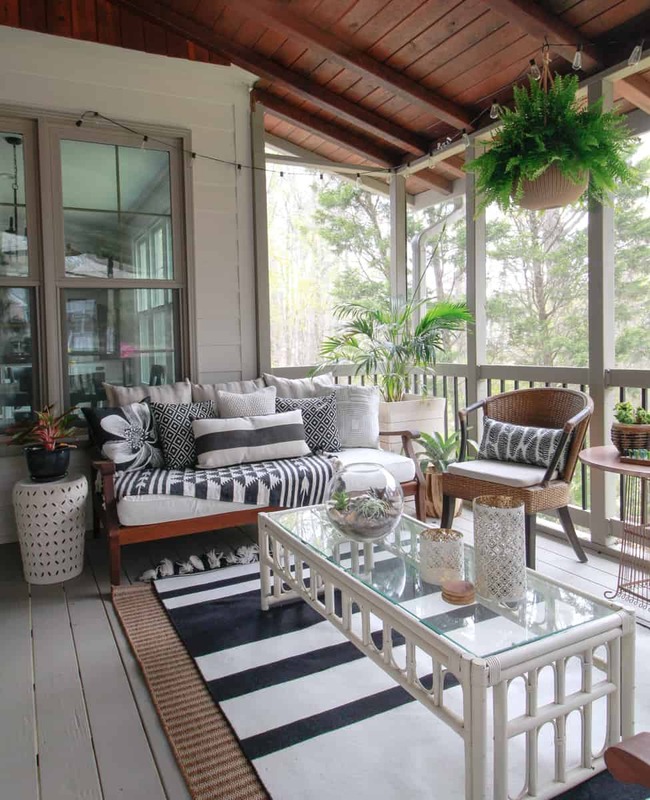 To update the porch for this season I made a few small tweaks to achieve a complete black and white color scheme. (There were a few hints of a light blue the last few years.) I love the new look and very pleased that I only had to buy a few new pillows! 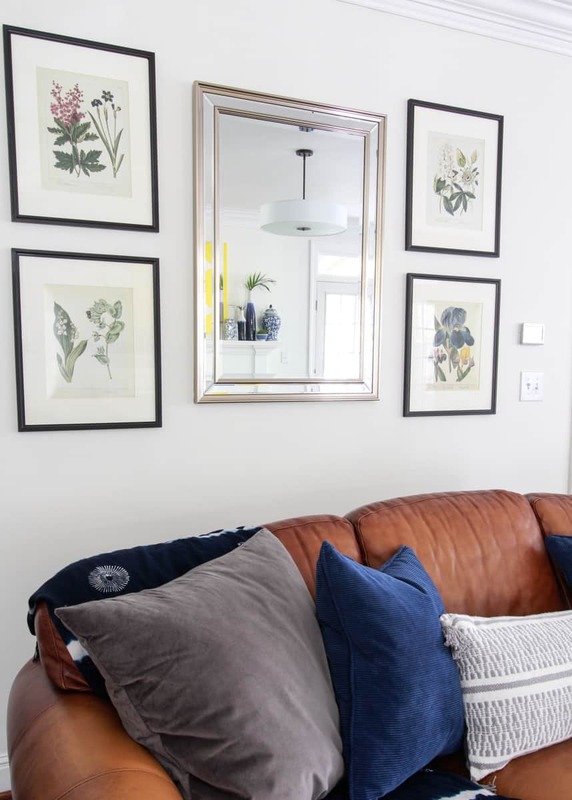 While I made changes in the living room and out on the porch in preparation for guests, they were definitely budget friendly refinements, like new “free” art and a few pillows here and there. 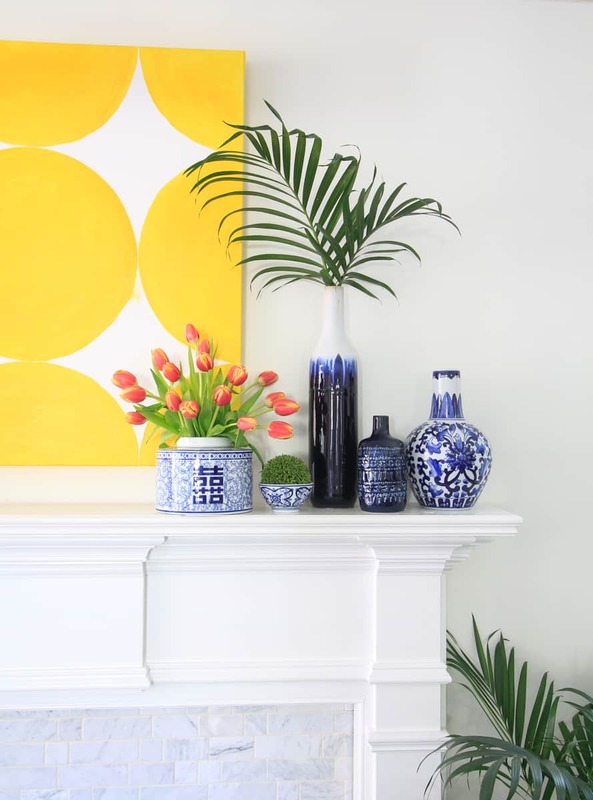 A spring refresh doesn’t have to mean re-creating a whole new look for your house. 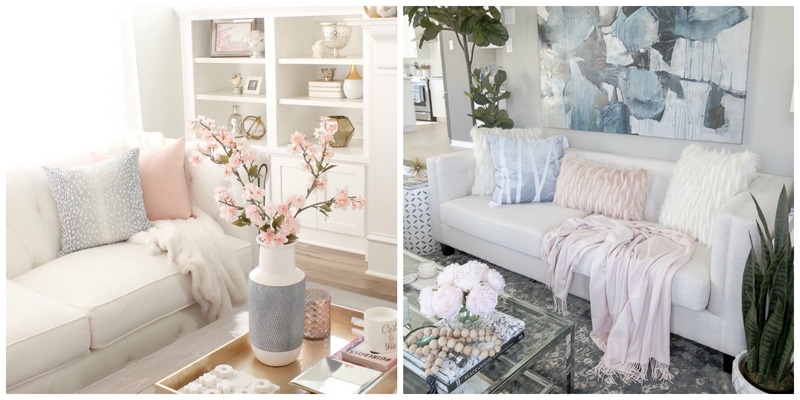 Even just a few additions or swaps make a room come alive for spring! 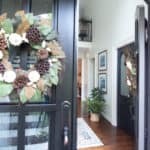 Be sure to circle through the complete line-up of the So many beautiful spring homes and rooms, you must see! 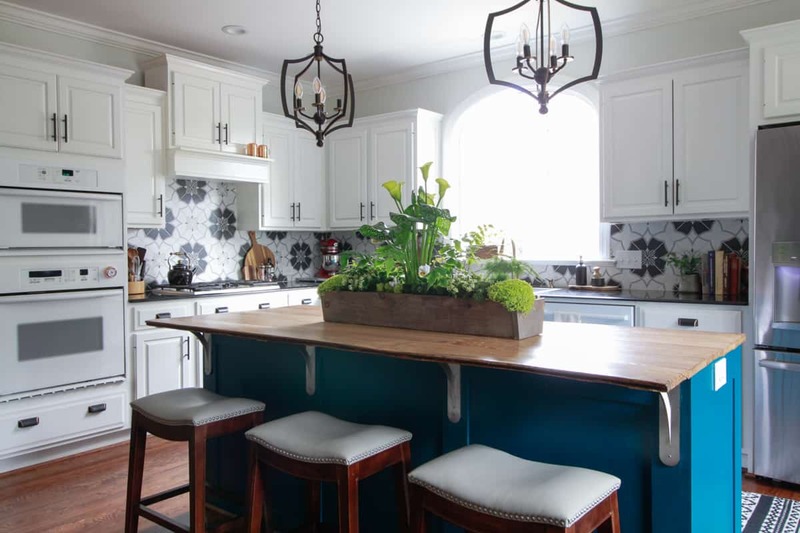 I love your use of colour, Leslie, and it feels perfect in your elegant and springy home! Great tour, so glad you could be part of this tour series!! 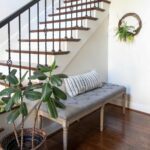 I’m new to your blog and your house tour was lovely! 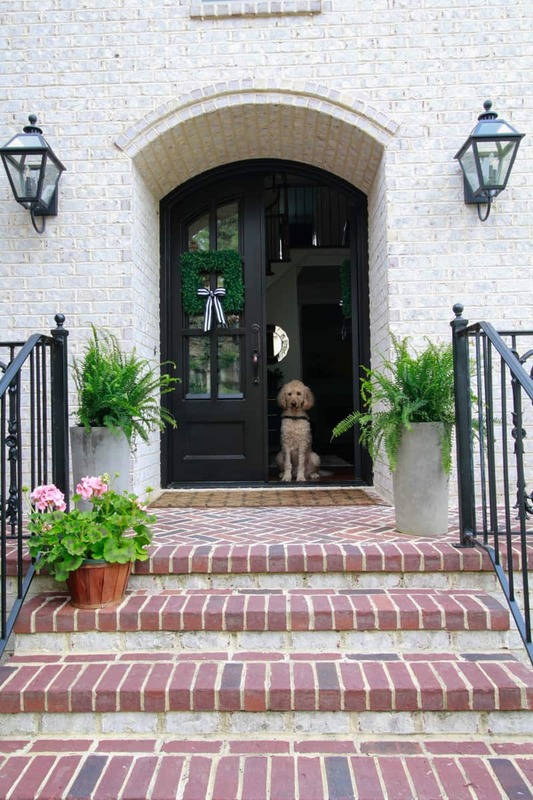 My apologies if you’ve been asked this before, but can you tell me where you obtained your front porch plant containers (the tall cylinders that look like concrete)? Thanks so much! Your email application went to an error message. You have a very lovely home. Before you get rid of your caramel leather couch, it’s coming back into style big time. Your home is gorgeous! 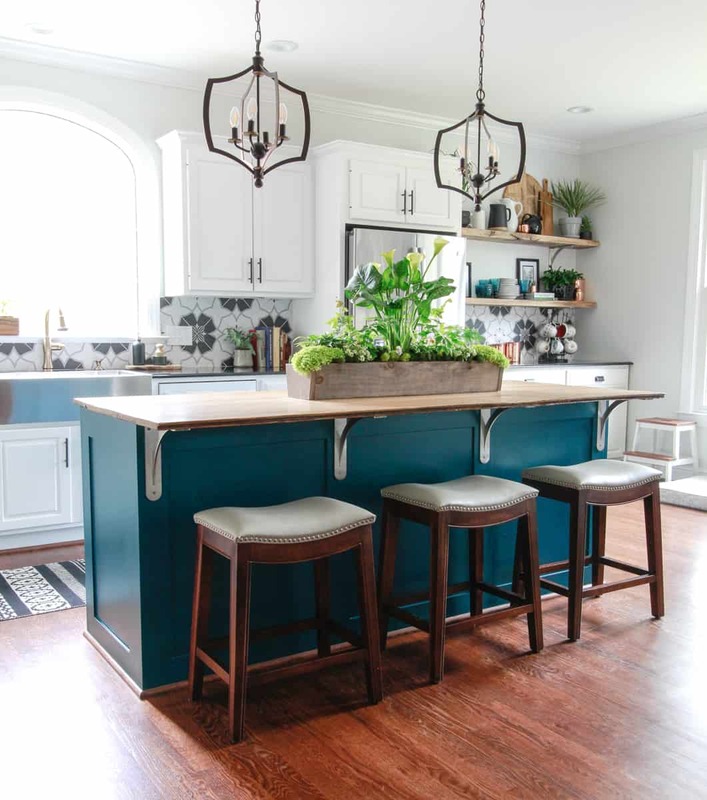 I love the pops of colors and the color of your kitchen cabinets. Your patio is dreamy! What a beautiful Spring Tour! 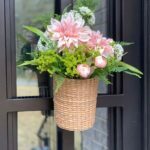 I love all the bright pops of color and your porch looks like a pure haven! I love your kitchen and screened in porch! So dreamy! I would live in that outdoor space! 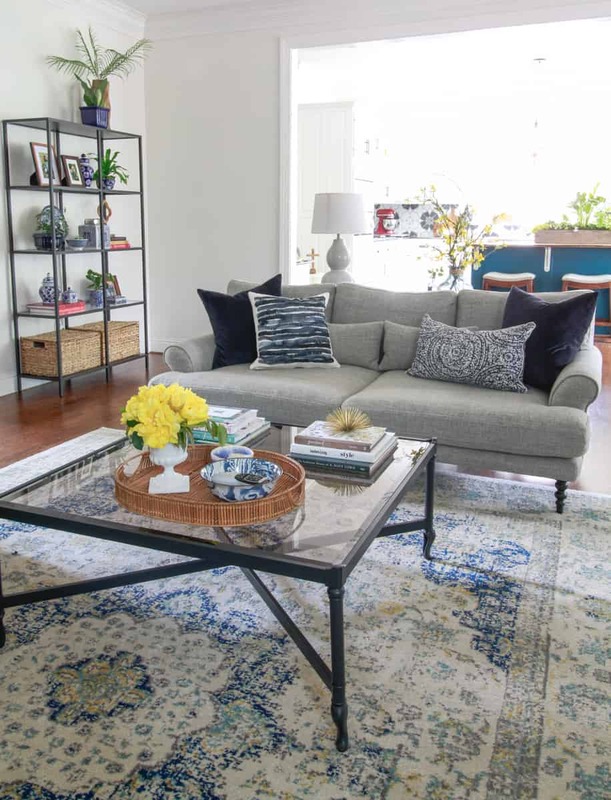 You have it decorated so beautifully, warm and livable, but so stylish!